A Norfolk Broads boating holiday provides a rich mix of attractions and activities suitable for all ages and parties. There are plenty of waterfront eateries, endless options for scenic walks as well as water sports activities, all suitable for a family boating holiday on the Norfolk Broads. The Broads are brimming with idyllic Norfolk villages and market towns, offering access to the coast and Great Yarmouth as well as the historic city of Norwich. With a large choice of convenient moorings, there are plenty of areas to explore on foot, all easily accessible from your hire boat! Originally thought to be an area of natural landscape, extensive research in the 1960s revealed that the Norfolk Broads were created by man. Over sixty Broads and six distinct rivers were created as a result of flooding following early peat digging (the peat was an important source of fuel), which dates back to the Roman era. The managed reed marshes and wildlife habitats you see today attract over seven million visitors each year, offering tourists the opportunity to visit twenty five sites of special scientific interest. Waterways Holidays offer a wide choice of boating holidays to cover the 125 miles of safe, lock free open waterways, from over ten marinas across the Norfolk and Suffolk Broads. The Norfolk and Suffolk Broads are known collectively as Britain's Magical Waterland and the Broads is a member of the family of National Parks. The Norfolk Broads, Britain's largest protected wetland is packed full with spectacular and rare wildlife and plants, an example being the Swallowtail butterfly, Britain's largest butterfly, unique to the Broads, appearing in June and sometimes August to September in warm summers. Dragonflies and damselflies also abound. You may be lucky and spot otters, water voles, the timid Chinese water deer and if you walk to the beaches beyond Horsey Wind Pump, grey seals which arrive in early winter to give birth to their pups and are still there in early spring/summer. The Broads' diversity of lakes and rivers offer lots of fishing opportunities. During the Open Season you can expect to catch a selection of rudd, bream, perch, pike and tench. The course fishing season runs from 15th June to 15th March, the only requirement is an Environment Agency rod licence which can be purchased from any Post Office. Visit one of the many waterside angling shops to stock up on your fishing gear and bait. Hire a boat for your holiday afloat and moor up in the middle of nowhere for a quiet bit of fishing in the evening, watching the magnificent sunsets and wide open skies. There are many different types of hire boat available for holidaying on the Norfolk Broads. Try sailing a traditional wooden yacht; the oldest little yacht you can hire is over 100 years old and is based on the design of a Victorian gentleman's yacht, perfect for 2. The larger yachts can sleep up to 8 people and if sailing isn't your thing, then you can still turn heads by hiring an original wooden Broads Cruiser, designed to be able to pass under the lowest of bridges on the River Thurne at Potter Heigham. If you like a few mod cons then why not hire a cabin cruiser from the huge choice of modern comfortable cruisers. These boats can feature onboard heating, TVs and 240V mains type of power, complete with bow and stern thrusters for easy steering, sleeping from 2 people (2 berths) up to 12 berths. All boats are hired complete with bed linen, some of the yachts have sleeping bags instead of duvets. They also come with cooking facilities, pots and pans, crockery and cutlery. You usually need to bring your own towels. All boats have at least one toilet and all the cruisers have showers. Because of their design it is not always possible to have a shower on a yacht, but there are showers close to overnight moorings on different parts of the Broads. Tuition is always given on arrival with all the boats; if you are hiring a sailing yacht, it is best that you have sailed before, however, sailing instruction by qualified RYA instructors can usually be arranged. Pets are welcome too! There are plenty of nature trails and open scenery to hop off and stretch your dog's legs. A lot of the pubs on the Norfolk Broads allow pets too. Why not kit your fluffy companion out with a doggy life jacket, available in sizes small, medium and large. Marinas are now starting to think of safety not only for the family but also for your treasured pet and you can usually borrow one of their doggy life jackets with the payment of a small refundable deposit. You can also purchase doggy life jackets online. Click for more information on routes and local attractions, or if you would prefer to hire a cottage on the waterfront in Wroxham village and watch the world go by. 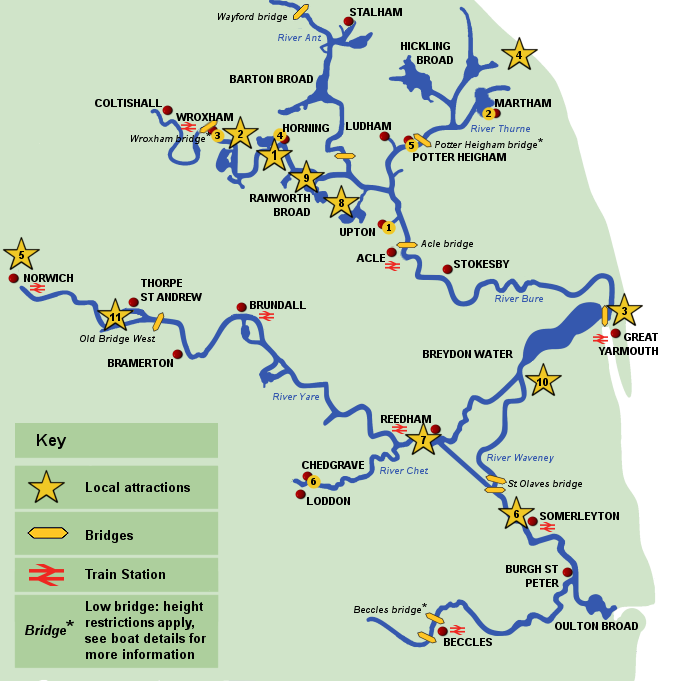 You can also purchase a Norfolk Broads map online.